Wild coffee, one of the lesser known native Florida plants, is a lovely, graceful shrub that produces berries similar to coffee beans. The shrub itself is a beauty - with glossy deep green leaves marked with deep grooves, giving the foliage a beautiful texture. ...not exactly what some people look for when creating edible landscapes, but a fun and unique addition just the same. 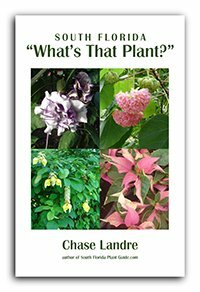 These South Florida tropical plants can be cold sensitive and need a sheltered location. They're a wonderful landscape asset as tall hedge shrubs for shade. You can also put them to use as a privacy screen or accent. The berries appear in summer after small white spring flowers and ripen to red. The flowers attract butterflies and the berries attract birds, making the plant a great addition to a wildlife garden. 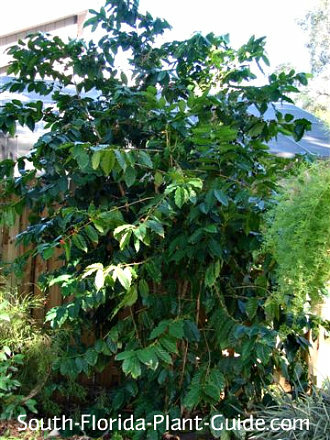 Wild coffee plants grow in sun or shade but seem to do best in partial to full shade. This fast-growing evergreen shrub can be kept 5 to 8 feet tall. It tends to stay smaller in sun, larger in shade with a richer deep green color and a bit more open growth habit. Zone 10 is best for this plant. It really hates the cold so place in a sheltered location and protect from cold snaps - especially in cooler areas of Zone 10. Wild coffee is moderately salt-tolerant. Although this shrub is a native, it will benefit from adding top soil or organic peat humus to the hole when you plant. You can also add in composted cow manure to enrich the soil around the rootball of the plant. Trim lightly anytime to shape, and do a hard pruning if necessary for size in spring - late March or early April. Water on a regular basis but don't keep the plant overly wet. Shadier locations tend to stay moist longer so check to make sure water is adequate but not overdone. If planting in a row, place the shrubs 3 to 4 feet apart. Come out from the house about 4 feet. Along a fence, bring the plant out about 3 feet. This shrub will work in a large container. COMPANION PLANT SUGGESTIONS: In a partly shaded area, consider peace lily, chenille plant, variegated ginger, Xanadu philodendron, cordyline, macho fern, dwarf tibouchina, croton, azalea and star jasmine.